The initial public offering (IPO) of Chennai-based Equitas Holdings Ltd, the holding firm for the fifth-largest microlender in the country, sailed through comfortably and was subscribed 17.17 times, or oversubscribed 16 times, at the of the final day, data available with the stock exchanges showed. The issue, which began on a slow note on Tuesday with subscriptions touching only 9 per cent and barely managed to cross the one-third mark on the second day, was led by high-net-worth individuals and corporates on the final day who bid for around 57 times their quota. While qualified institutional buyers, who mostly stayed away on day 1 and subscribed over a quarter of their portion on second day, bid for around 15 times of the quota reserved for them, retail investors' portion was oversubscribed 32 per cent on the final day. It is not unusual for IPOs to get fully covered on the final day of the three-day period; indeed, many issues get completely subscribed on the last day. Ahead of the IPO, the company raised Rs 653 crore from 16 anchor investors by allotting 5.93 crore shares at Rs 110 each, the upper end of the price band. Anchor investors include Wipro chairman Azim Premji's private investment arm PremjiInvest. A host of mutual funds and insurance firms, including Franklin Templeton MF, Birla Sun Life Trustee Co, SBI MF, UTI MF, ICICI Prudential MF, Kotak Mahindra MF, HDFC Standard Life Insurance, Birla Sun Life Insurance, Sundaram MF, Tata AIA Life Insurance, Reliance Life Insurance and Ambit Alpha Fund were the other anchor investors. Equitas had earlier changed the terms of its IPO. The firm is the second microlender to go public after SKS Microfinance listed on the bourses in 2010. The firm was looking to raise as much as Rs 720 crore through a fresh issue of shares besides an offer for sale by a bunch of its private investors and founder PN Vasudevan. In its draft prospectus filed with capital markets regulator SEBI last October, Equitas had sought to raise up to Rs 600 crore. Of the total money raised through the fresh issue of shares, the company plans to use over Rs 600 crore towards investment in subsidiaries to augment their capital base. 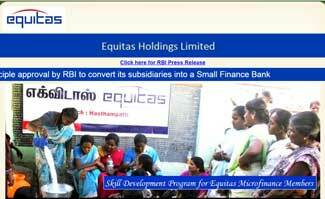 Equitas is a holding company and operates through three subsidiaries. The units are engaged in microfinance lending and also offer mortgage loans, vehicle loans and loans to micro and small enterprises. Edelweiss, ICICI Securities, Axis Capital and HSBC were the merchant bankers for the IPO.